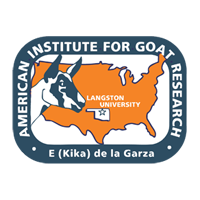 Thirty-three yearling Katahdin sheep (K) and Boer (B) and Spanish (S) goat wethers were used to evaluate effects of stepwise increases in heat load index (HLI) to develop a method of evaluating resilience of individual animals. Moderate quality grass hay was consumed ad libitum with concentrate (80% corn, 20% soybean meal) at 0.5% BW. After a baseline period (1) with thermo-neutral conditions, target HLI were 80, 90, 95, and 100 (e.g., 42.0° C, 40% relative humidity) during the day and 70, 77, 81, and 85 at night in subsequent 1-wk periods (2-5). Actual values averaged 66, 80, 92, 97, and 101 during day (0700 to 1900 h) and 66, 75, 84, 86, and 89 at night in periods 1-5, respectively. At the end of periods, BW was not markedly affected by HLI (100.2, 99.7, 103.1, and 101.3% of baseline; SE=0.74), and hay DMI also was generally similar to the baseline (95.0, 72.4, 93.6, and 96.4% in periods 2, 3, 4, and 5, respectively; SE=3.69). Rectal temperature measured at 0600, 1300, and 1700 h was lowest for Katahdin in periods 3 (39.4, 39.2, and 39.6°C) and 4 (39.9, 39.6, and 40.0°C for Boer, Katahdin, and Spanish, respectively; SE=0.07) but similar at other times. There was an interaction in respiration rate between animal type and period (71, 105, and 105 in period 2, 93, 101, and 104 in period 3, 121, 139, and 129 in period 4, and 105, 126, and 109 breaths/min in period 5 for B, K, and S, respectively; SE=4.75). Rectal temperature and respiration rate were much lower at 0600 h (38.7, 38.9, and 38.8°C and 34, 77, and 56 breaths/min) than at 1300 (39.7, 39.6, and 39.9°C and 127, 137, and 135 breaths/min) and 1700 h (40.1, 39.7, and 40.2°C, SE=0.07, and 131, 139, and 144 breaths/min for B, K, and S, respectively, SE=4.4). In conclusion, in some periods K exhibited greater ability than B and S to increase respiration rate and minimize rectal temperature at high HLI; periods longer than 1 wk at high HLI are required for evaluating changes in BW and DMI; and variables such as rectal temperature and respiration rate may be more meaningful when measured in the afternoon than morning after lower nighttime HLI.